It’s always a gamble introducing a new author to Star Wars, and when that author decides to change things up even more by writing their book in a different narrative, the odds get stacked against them. Add on top of that the fact that this is now a part of canon and it stars one of the most famous characters in all of Star Wars, and you get an almost insurmountable hurdle. How can anyone hope to meet those expectations? Well, luckily Kevin Hearne knows what he’s doing. He knows how to tap into characters, make them immensely enjoyable for the readers, and tug on people’s emotions. Heir to the Jedi takes Luke on an adventure but raises the bar by not only making him likeable, but by making his journey something of significance. While on the surface this might be another throwaway adventure, Hearne adds an element that ties this story into the mythos of Star Wars. This book becomes one of the pivotal steps in Luke’s journey to being a Jedi. For those who don’t know, Kevin Hearne is the author of the Iron Druid Chronicles series, a great line of books mixing fantasy and reality. All of those books are written in first person narrative, so it’s no surprise that he would continue to do so when given the opportunity to write Star Wars. To this date, the only other Star Wars adult novel to be told from the first person narrative is I, Jedi by Michael A. Stackpole. 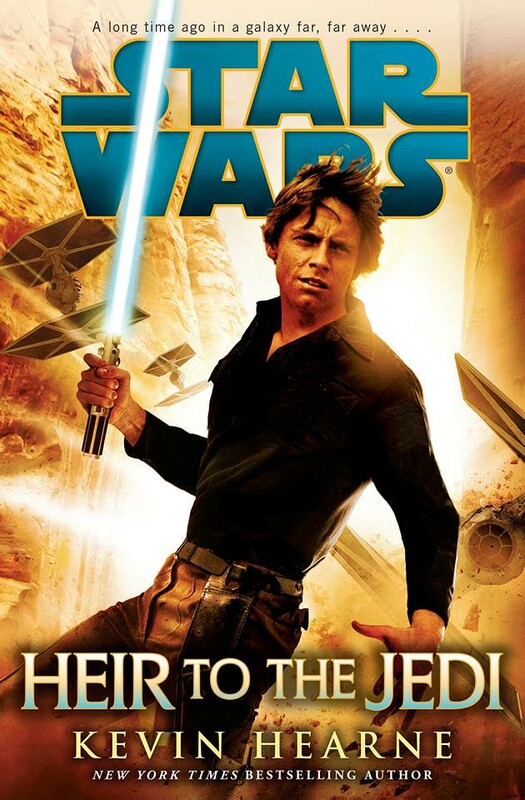 As a long time reader of Star Wars books, I have to admit it was a little odd diving into Heir to the Jedi and reading the story from Luke’s perspective at first. After 200 books, you get used to they way the narratives are structured. But after a while, the style of narration disappears and the story and characters come to the forefront. It no longer mattered that Luke is recounting everything, instead, it was fun to see these new and old characters come into play. It was enlightening to get glimpses into Luke’s head and to see his own thoughts on the Force, the events that unfolded in A New Hope, and how all of that has affected him. By the end, you’re left shocked that there was actually a meaningful story left for a Luke Skywalker tale at such an early point in the timeline, and all thoughts of narration fall completely by the wayside. The magic of the story is the characters. In A New Hope, Luke was pretty whiney. Heck, he was still kind of whiney in The Empire Strikes Back. In Heir to the Jedi, there is no whiney Luke. This is a Skywalker who has been introduced to the Force, blown up a Death Star, and is now trying to live in the wake of all that. He’s had some time to deflate his ego, appreciate how much he’s matured from his whiney self, and come to realize just how much about the Force he doesn’t know. These are all topics that are brought up and tackled in the book. Of greatest importance is Luke’s challenge with the Force. Without Obi-Wan to teach him, how can he make any progress with learning the ways of the Force? How does Luke get to the point in The Empire Strikes Back–hanging upside down in the wampa cave–where he can close his eyes, relax, and call his lightsaber to his hand? This book answers that. But it does one better than just giving a simple answer, it fully approaches the problem and turns the idea into an entire subplot for the story. Mix in Luke’s own wry humor, frank honesty, and willingness to help others, and you get a Luke Skywalker who feels like the Luke we grew up with. Hearne nails it. So what about new characters? In this regard, Heir to the Jedi opts for a small, tight-knit cast. There are lots of smaller roles, from cameos like Ackbar and Leia, to new characters like Rodian weapon dealers and Kupohan spies, but there are also characters of real significance. One of them is Drusil Bephorin, a Given slicer and cryptographer who becomes a supporting character late in the book. The other character of importance–and the second most important character in the book next to Luke–is Nakari Kelen. Nakari is a bit of a treasure hunter, but with a scientific bent. Her father runs a biolab corporation and she made a living hunting down interesting scientific finds on various worlds. Having joined the Rebel Alliance, she offers her ship to help out on missions. Eventually, her and Luke team up to rescue Drusil from the Empire. Through the story, her character is explored and she becomes a central part of the story and a key source of humor. Nakari had me laughing out loud at numerous points and her antics with Luke were some of the best parts of the story. But Nakari isn’t just a humorous companion. When thrown into combat, a completely different side of Nakari is revealed. She’s no nonsense and straight to business. When you put someone down, you shoot them twice to make sure they stay down. It’s a stark contrast between her playful joking side, and I couldn’t help but be reminded of the way Aaron Allston wrote the characters of Wraith Squadron. Rather than being one dimensional, Nakari is fully developed and thereby completely engrossing. She’s my favorite character in the novel and Hearne does a terrific job writing her. Against great odds, Kevin Hearne manages to pull it off with Heir to the Jedi. It’s an excellent book with rich characters, bubbling humor and poignant emotion. It may take a bit to get sucked into the story, but once you’re there, Hearne keeps you there for an entertaining ride. When the book was first announced, I wasn’t sure there was that much that could be done with a Luke Skywalker novel since he’s one of the most used characters in the franchise. To my surprise, it turns out that there was a lot left to be explored, and thankfully Kevin Hearne finds that angle and brings it to light. I give Heir to the Jedi a five out of five metal bikinis.